A Big Murder, at the Manor [Download] - �.99 delivered. It's Murder at the Manor but bigger! Enjoy the same murder mystery but now with six all-new suspects to accommodate up to 20 guests! You抮e invited to Heathcliff Manor, where Lord Heathcliff is hosting a dinner party to celebrate his recent marriage. But before anyone can toast his happiness, Lord Heathcliff is killed with the candlestick in the pool room. Host your own party to find out who snuffed out his candle! * Play with ANY number or combination of 6-20 suspects. * Host can play too. * The murderer is secretly chosen on the night so 'no shows' are fine. * No random guessing! Suspects have alternate stories if they're guilty to help you solve whodunit. * Fully scripted questions and answers for maximum fun and minimum effort. * Invite your guests to murdermysteryparty.co.uk to view detailed suspect bios and costume suggestions. 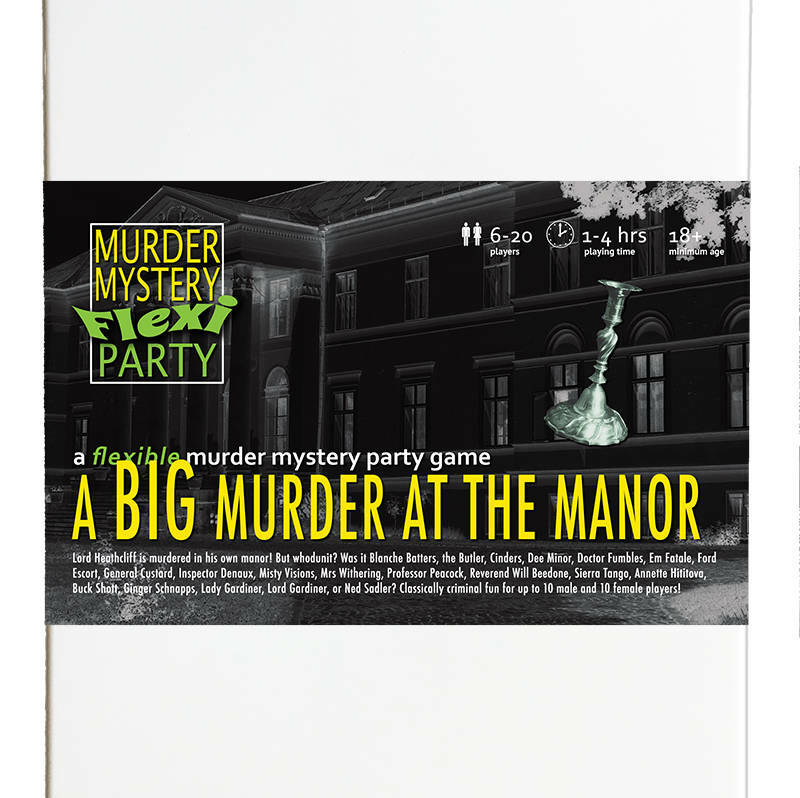 * Murder Mystery Flexi Party�/a> takes the stress out of hosting and is our bestselling brand! GUIDANCE : murderous themes, mild innuendo, marital affairs and no profanity. This game is recommended for ages 18 and upwards as it is not a toy. However, we feel all versions of Murder at the Manor, Train and Roaring 20's could be suitable for teenagers. Parents should examine the contents fully for suitability before allowing their children to play this game.